While working in military or law enforcement is life-threatening, some appropriate attire can reduce the risk of danger. One example is the best tactical vest that is worn over regular clothing to provide protection and storage for essential equipment. We will feature the three tactical vests that withstand action-packed activities. There are reasons why the tactical vests below are outstanding. They have the critical factors to consider such as the weight, number of pockets, heat buildup, and plate material. All these factors contribute to the reliability, storage, and protection essential for tactical training and combats. The following bestselling tactical vests vary in features, price, advantages, and drawbacks. The best choice is relative, which means it lies within the user’s needs and preferences. Made with high-quality materials that are lightweight and resist tears, the Gloryfire Tactical Vest is not your ordinary vest. It is different from most competitor tactical vests made of cheap fabric that look like high-end material. Size: It is medium in size but is adjustable up to an extra-large size. The waist size ranges from 30 to 60 inches. Comfort: The construction of Gloryfire Tactical Vest makes it comfortable and practical. It has detachable anti-slide cushioned shoulder pads with hooks and loops. The sides are open, which allows airflow to prevent heat build-up. For more comfort, the interior lining is made with cushioned mesh material. Adjustability: The front of Gloryfire Tactical Vest has a map pocket with hooks and loop closure as well. The sides of the shoulders are release buckles, and the inside of the waist has a strap to secure fit. Pockets: It also comes with emergency drag handle, six open-top M4 mag pockets, four flexible loops on each side, and an interior mesh pocket. Colors and weight: Available in various colors to choose from (tan, black, camo black, and olive dab), the Gloryfire Tactical Vest can best match personal color preferences and styles. Weighing about 2.4 pounds, this tactical vest is quite lightweight, so it is not cumbersome and is easy to transport. If you are on the lookout for a compact, lightweight tactical vest, this SDS Official US Military Tactical Vest is a good choice. While it has a simple built and style, it offers valuable features at an ultimately affordable price. Material: The SDS Official US Military Tactical Vest is made of 100% premium 1000D Cordura nylon material which makes it lightweight and easy to carry. Adjustability: It has a one-size-fits-all design and has an adjustable waist belt to secure the fit for all users. It is compatible with MOLLE/MPLLE II attachment mechanism. Pockets: The SDS Official US Military Tactical Vest has three sets of load carrier which requires personal set up for different purposes. Usage: Aside from military purposes, the SDS Official US Military Tactical Vest can be used by hikers to attach or carry small equipment for any day or long haul camping or hiking. Fit: The SDS Official US Military Tactical Vest has a secure fit made possible by the front closure or big buckles at the front waist and chest. Size and weight: With dimensions of 11.3 by 7.1 by 4.4 inches and weight of about 1.6 pounds, the SDS Official US Military Tactical Vest is portable and easy to carry even when training or combating. For the firefighters and law enforcement officials, this UTG Tactical SWAT Vest is an appropriate choice. It can also be suitable for anyone who needs rugged built with various practical mechanisms. 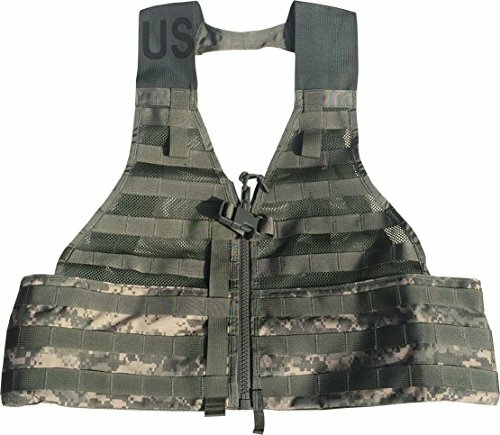 To guarantee quality, the manufacturer offers a limited one-year warranty in case of any defect on the accessories, materials, and built of this UTF tactical vest. Material: The UTG Tactical SWAT Vest is made with rugged nylon that is not only durable but also keeps the vest look brand new for long years. The interior part offers comfort and protection. 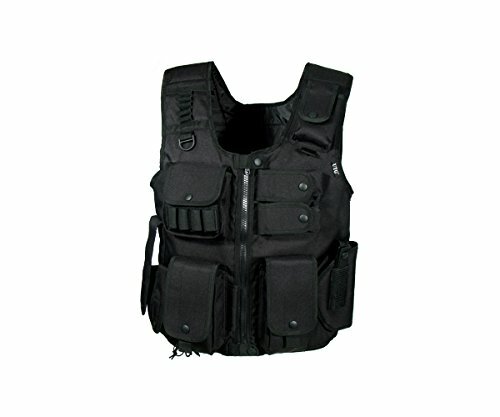 Weight and size: It is a 3.5-pound vest with 23 inches length and a torso that is adjustable from 40 to 54 inches. It is fully adjustable through the waist and shoulder so that it can fit into different body sizes. Pockets: The UTG Tactical SWAT Vest is made with various pockets to accommodate essential equipment. It has pistol pockets, rifle magazine pouches, thumb break holster, radio pouch, and flexible loops for shotgun shells. Design: The design of the UTG Tactical SWAT Vest is generally positive. It may not look as heavy duty as the other tactical vests, but it has strong overall construction. Moreover, the pockets and closures secure the equipment and fit. When it comes to tactical vests, a few important considerations must be looked into. The durability of the materials and construction are obvious considerations, but not all tactical vests are true to their advertisements. The weight is also important; the lighter a vest is, the easier to move around with it. Additionally, the number and size of pockets must also be considered. The abovementioned best tactical vests have important qualities and features. While there is no perfect product, the best choice boils down to the user’s purpose and preference. For a multipurpose tactical vest, the Gloryfire Tactical Vest stands out because of its design, material, and pockets which offer comfort, protection, and practicality. Although it comes in a small size, the Gloryfire Tactical Vest is adjustable and comes in different colors. Its pockets can hold essential equipment, and the straps are pretty secure. 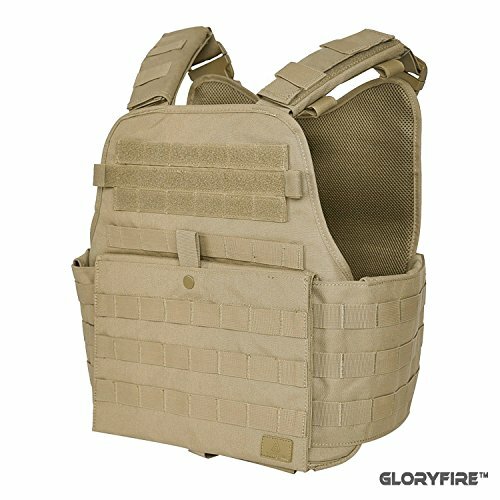 For a reasonable price, this Gloryfire Tactical Vest is among the best buys in the market today.